Officers Rocket and Stubbo are being chased through the Florida Everglades by the crimelord Tumeric Squeekle and his Contrat army (they smuggle hard cheese across the border, apparently). The Contrats are slowly killed off one by one at the blade of an unseen foe until Tumeric eventually weeds the assassin out. It’s Catztanza, a samurai or a police chief or something, I don’t know. Binding Catztanza, he demands to know where Rocket and Stubbo are hiding. The feline won’t talk, so Tumeric prepares to execute him. Just then, one of the Contrats decides to sit down on what he thinks is a rock. Turns out, the “rocks” are the shells of the Teenage Mutant Ninja Turtles! Upset about being roused from their nap, the Turtles spring into action, annihilating all the Contrats. Tumeric gets the upper hand on them, though, and aims a missile launcher in their direction. Before he can fire, Rocket leaps down from the trees with a length of wire in his hands. He wraps it around Tumeric’s neck, strangling him to death. Rocket and Stubbo are reunited with Catztanza and some chick named Vermousa (or "Vermoosa"? They spell it two different ways in this issue). A job well done, they decide to take the Turtles to a bar to thank them for their assistance. At the bar, the Turtles bump into their old pal, Cerebus! Cerebus is in no mood to deal with socializing, though he’s grateful the Turtles didn’t bring “that dippy broad” with them, this time. Unfortunately, Vermousa takes a liking to Cerebus and starts putting the moves on “Cereby”. Luckily for the Aardvark, the “crossover spell” wears off and he vanishes back to his universe. *Due to the overtly silly nature of this comic, I wouldn’t consider it “canon” with anything else in Mirage. But whatever. *The above summary only covers the portion of the issue featuring the Ninja Turtles and Cerebus. *The Turtles first met Cerebus in TMNT (Vol. 1) #8. They’ll appear alongside him one more time in The Savage Dragon #41. *This issue also contained two “The Stories of Paco” bonus strips, by Mark Bode', J. Flores and Bill Fitts, as well as letters and fan art pages. This is the only issue of Bode’s Miami Mice I’ve read and I’m not too inclined to go back issue bin diving for any others. Bode’ is an excellent cartoonist and his contributions to the “Guest Era” of TMNT Volume 1 were pretty enjoyable one-shots. This, however, is not some of his better work, relying on badly dated pop culture parodies to serve as inspiration for a tenuous narrative. I’ll concede that starting at the fourth issue left me at a disadvantage, but there are times when I couldn’t tell characters apart or even how they were jumping in and out of the story at random intervals. This was an early collaboration between Bode’ and Mirage, and he would definitely improve by leaps and bounds after just a couple more years. As for the Turtles, I’m not really that interested in cataloging every single 80’s indie comic they made cameo appearances in, as that would just be inane and suffocating (they got around, back then), but this appearance scores some bonus points. Firstly, the Turtles are drawn by Eastman and Laird (while Bode’ and Fitts handle all the other characters and the environments). It’s interesting to see the two artistic styles clash like this and, while it isn’t perhaps the best stuff they ever put out, it’s vintage Eastman/Laird art nevertheless, and that’s always cool to see. 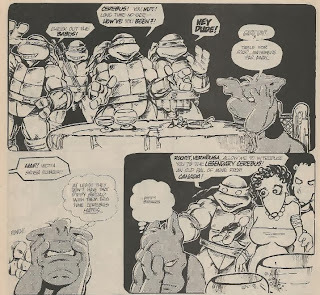 The second big attraction is a cameo from Dave Sim’s Cerebus; his second encounter with the Ninja Turtles (he even references Renet and their first adventure). Like the Turtles, Cerebus is drawn by his creator for his appearances and we get this weird art jam for two pages, as Bode’, Eastman/Laird and Sim all draw their characters in their own unique styles, coexisting together. It’s neat, but that’s about it. From a storytelling standpoint, their inclusion in this tale is absolutely awful; guest appearances at their most gratuitous. While the Turtles at least randomly show up to save the day, Cerebus is nothing but a “hi” then “bye”, reminding everyone that he exists and then leaving. 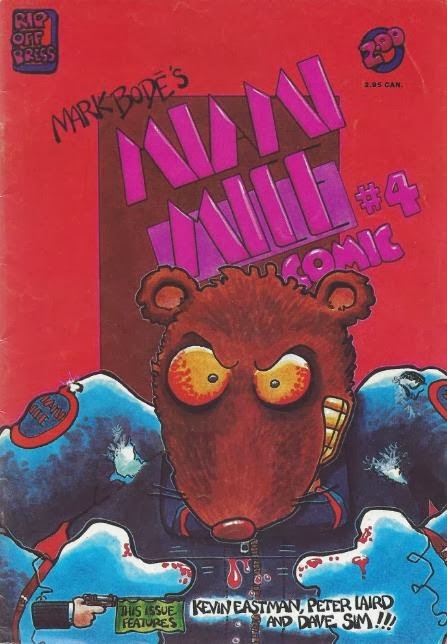 Well, the good news is you can find most copies of Miami Mice in the quarter bin at your local comic shop (that’s also where you’ll find most non-TMNT Mirage comics). It’s a random, zany novelty and if you’re absolutely starved for more Eastman/Laird sequential TMNT content, then this might be your last stop before oblivion. There actually aren't too many other comics the TMNT made official guest appearances in, just Equine the Uncivilized #3 and 6, Pre-Teen Dirty-Gene Kung-Fu Kangaroos #1, and Last of the Viking Heroes Summer Special #2-3. And I hope that you eventually talk about them. Maybe you could review the two Viking Heroes Summer Specials either before or after the story "Teenage Mutant Ninja Turtle" from Turtle Soup #4 (also featuring the Viking Heroes). Anyone else suspect that Steve Lavigne may have lettered the Turtles' dialogue? It seems Dave Sim lettered Cerebus's dialogue, and I guess Mark Bode' did the rest.